Pixar has been the most consistently good film studio for the past 16 years. They invented the computer animated movie, but they did so with so much care in story and character, that although they make movies for kids, the movies never felt like they catered down to kids. Adults have recognized the maturity of stories found in the three Toy Story films, Up, Wall-e and a half dozen others. “Cars” was the 2006 installment in the summer movie field that Pixar has always dominated, artistically if not always financially. It is Amanda’s favorite Pixar film (mine being “The Incredible s”). As a salute to nostalgia and the original Route 66, “Cars” was a warm piece of comfort food easily digested and easily repeatable. I have read many on-line comments that suggest that it was the weakest of the Pixar films. To me, that is like saying it was a home run that simply cleared the fence, rather than one which ended up in the upper decks or out of the park. I never had reason to complain. No one however, can be perfect for all of their career, if they are planning on staying in the game for an extended period of time. “Cars 2” brings to a close that long home run streak started back in 1995. 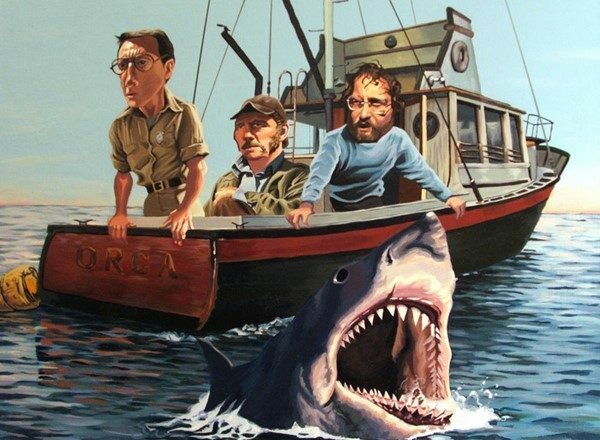 This movie is disappointing to us because of our love of the original movie. The vistas of Arizona and New Mexico are replaced with gorgeous versions of Tokyo and The Italian Riviera. The artistry of the animators and the talent of the cinematographer is not any less than the original. There are some fabulously designed graphics in the movie. The race sequences are edited together very effectively and create short bursts of energy in the movie. Unfortunately, the failings of “Cars 2” come in the one area that has always been a strength for Pixar, storytelling. 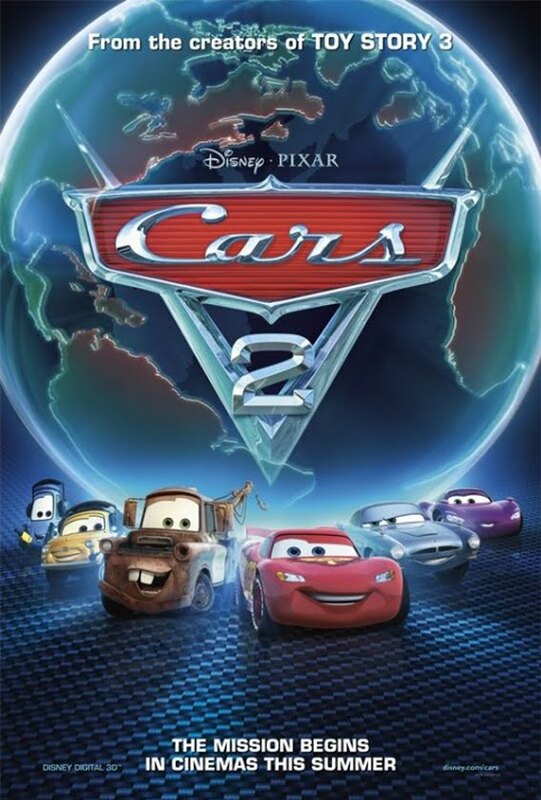 The first misstep was in conception, “Cars 2” is a conventional Spy Action movie. It’s premise sounds like a Jackie Chan film, but not one of the great Hong Kong Jackie Chan films, rather more like one of the flaccid Hollywood films that try to use Chan’s talent in a cookie cutter mainstream film (think “The Tuxedo” or “The Spy Next Door”). Lightning McQueen and Toe Mater, get caught up in international intrigue and Mater is mistaken for a top American secret agent. Mater’s native mannerisms and frequent mistakes are viewed as brilliant cover by a pair of British agents trying to crack a conspiracy to torpedo a new energy source. Larry the Cable guy can be entertaining in some limited doses, but he is actually the star of the movie, not Owen Wilson’s Lightning McQueen. Larry as Mater is no Cary Grant. His dumb act is so real that anyone thinking he was merely acting would have to say he is the greatest actor in the world. The opening section sets up the spy stuff pretty well with a nifty take on James Bond being done by Michael Caine as Finn McMissile. The problem is that almost nothing that follows really requires the car races that the movie is set up around. The races are peripheral to the spy plot, and most of that action takes place away from the track. There are some funny pieces in the sequence where Mater crosses paths with the real American agent in a Japanese bathroom. And at the spy headquarters, there are some clever visual jokes with the disguises that Mater will have to use to get to the hidden power behind the plot. Nothing in the plot makes any sense however. I won’t provide a spoiler, but the whole reason for the deception by the real villain, and the plot to discredit a new energy source is simply counter-intuitive. I could follow any Bond film, all the Mission Impossible movies and The Usual Suspects, and still make some sense out of what was going on. In this movie, I could not do that. The motive is confusing and the execution of the conspiracy defeats it’s own purpose. Also, this is an entertainment, that is really directed at kids, and the political message in it seems heavy handed and hypocritical coming from all those gearheads at Pixar who created these characters in the first place. The original “Cars” lost the Academy Award to the movie “Happy Feet” back in 2007. That movie turned from being a charming children’s story about dancing penguins into a loathsome screed about global warming. Maybe John Lassiter felt the sting of that loss too greatly and decided to insert his own sucker punch into the same series. I don’t mind a movie having important themes, but they ought to fit in with the tone and characters that the movie is about in the first place. Returning to my baseball analogy earlier, this film is not a strikeout. It basically is a ground rule double that wastes the talents of some pretty good voice actors. Caine should have more to do with the story after the set up of the plot. Eddie Izzard is cast in a manner that immediately gives away a key plot point. Finally, the greatest of injustices, Bruce Campbell, is given only two brief scenes in which to strut his iridescent comic persona. If you had left Lightning off at the race course and let Mater go with the American agent played by Campbell, you would have a comic team that might be worth following. The music was solid but not peppy and infectious like the first movie. The loss of George Carlin and Paul Newman since the first movie, also means that some real high wattage voice talent is missing from this edition. “Cars 2” was fine for an afternoon if you have little kids, but it plays like a weak Disney sequel rather than an new essential entry into the Pixar Cannon. ← The Lord Of The Rings The Two Towers Extended Edition.